When Hayes was healthy, his White Sox manager Jimmy Dykes called the second baseman “absolutely the best double play man of his time.”2 But it was not injury that drove him into early retirement. An eye ailment left him blind. Minter Carney Hayes was born to the former Mary Celeste Jones and Julius Poe Hayes on July 19, 1906, in Clanton, Alabama. His mother had chosen the name Minter, but his father wanted “Jack.” They both got their way. Minter went on the birth certificate; the boy was always called Jack. When teammates kidded him about his tiny hometown, he insisted that Clanton, about 50 miles south of Birmingham on today’s Interstate 65, was an incorporated municipality with not one but two main streets. Jack attended Gulf Coast Military Academy and entered the University of Alabama. The legendary Wallace Wade, who coached football and baseball, made him the shortstop on the baseball team. "My Daddy wanted me to follow in his shoes and be a doctor,” he said, “but when I was in the laboratory working on an experiment, and the soft spring breezes drifted through the window, and the crack of ball against bat could be distinctly heard in the distance, I knew I had to be a ballplayer. 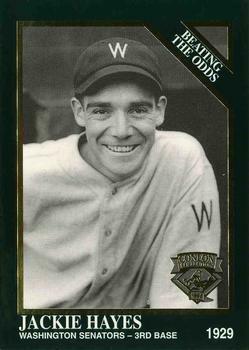 "3 He left school after two years to sign with the Birmingham Barons in 1927. When he joined the team, Hayes was on crutches recovering from a knee injury. He sat on the Barons’ bench for two months without getting into a game before the club sold him to the Washington Senators. Washington scout Joe Engel said he could be a star “if he could hit a lick.”4 A right-handed batter, Hayes appeared frail at 5-feet-10 and about 155 pounds. He made his big-league debut as a pinch-runner on August 5, shortly after his 21st birthday. He stuck with the team the next spring and played 60 games at second, third, and shortstop, batting .257, before he was farmed out to Double-A Minneapolis in July. He hit .332 for the Millers in 57 games, the only minor league games of his career. That arrangement didn’t last long. In July a knee injury ended Bluege’s season and resurrected Hayes’s. He wound up playing 123 games in 1929, batting .276/.316/.351. That didn’t impress anybody in a year when the entire American League hit .284. Chicago manager Lew Fonseca put him in the lineup on Opening Day, but benched him after just nine games because he didn’t hit. Hayes reclaimed the second-base job in July and raised his average to .257 by the end of the year. He was the weakest hitter in the lineup of the seventh-place Sox, but his defense lived up to expectations. His range factor per nine innings was tops in the league. That secured his job for another year, but his hitting didn’t improve. Hayes’s injury problems began in 1934. A sore elbow required surgery in May. He came back to play only five games before he broke his right thumb on July 4 and missed another month. He got into only 62 games all season. The next year he chipped a bone in his left thumb taking a throw during infield practice on May 21 and was out for nearly four weeks. He reinjured the same thumb in July, costing him most of that month and limiting him to 89 games. When the White Sox proposed cutting his salary for 1936, Hayes held out during the winter before signing for a $1,000 cut, to $6,500. With all the injuries, Tony Piet had taken over second base. Hayes played some shortstop when Luke Appling was hurt and was hitting over .300, so he won his old job back. Healthy for a change, he enjoyed his best year yet at the plate: .312/.366/.444, driving in 84 runs in just 108 games. He had plenty of RBI opportunities hitting sixth behind Appling and Zeke Bonura, who both recorded on-base percentages far above .400. Hayes got his money back and then some: a $2,500 raise to $9,000. Owner J. Louis Comiskey may have been feeling generous after the White Sox finished fourth, their best showing since the Black Sox were banned in 1920. Hayes felt prosperous enough to marry Alice Brooks in October 1936. Free of injuries again in 1937, Hayes played in a career-high 143 games and led American League second basemen in assists, double plays, and range factor per nine innings. His batting average collapsed to .229, but he still drove in 79 runs. It looked like more of the same when he started the 1938 season by going 0-for-13. Then he hit safely in 14 straight games and took off on the year of his life. By July 13 he was batting .329. With two out in the ninth, Hayes tried to beat out a grounder to second. He twisted his right knee as he crossed first base and was done for the year. After just one more at-bat, he left the team to have surgery. Doctors removed bone and cartilage chips, but he was still limping the next spring. He reportedly signed a dollar-a-year contract and had to prove he was fit to play. He wasn’t. He struggled through 72 games before going home in early September. Desperate, he underwent a second operation and spent the winter running up and down stairs, riding a bicycle, doing squats — anything he could think of to strengthen the knee. It never did. Hayes visited 10 doctors and received several diagnoses — infection, inflammation, cataract — but no relief. He actually had glaucoma. He wouldn’t give up. He played in a handful of games, but didn’t start for the first time until August 21. Wearing a makeshift helmet with ear flaps and closing his right eye when he stepped into the batter’s box, he went 2-for-3. “You know what the trainer told me? He said, ‘You ought to have been blind a long time ago.’”10 With one eye, Hayes batted .195 in 18 games. The White Sox honored Hayes with a night at Comiskey Park in 1949. Tony Piet, who had competed with him for the second-base job, paid his way to Chicago. A crowd of more than 12,000 feted him with cash and other gifts. He was elected to the Alabama Sports Hall of Fame in 1976 along with quarterback Bart Starr, pitcher Rip Sewell, and others. An annual trip to the Hall’s induction ceremony was a highlight for the rest of his life. Hayes died at 76 on February 9, 1983. 1 Irving Vaughan, “Hayes Hobbles To Camp With New Sox Grief,” Chicago Tribune, March 2, 1939: 21. 2 Shirley Povich, “This Morning,” Washington Post, August 10, 1945: 8. 3 Eugene Murdock, “Jackie Hayes — Triumph Over Tragedy,” Baseball Research Journal 9 (SABR, 1978). 4 Povich, “This Morning,” January 22, 1938: X18. 5 Frank H. Young, “First Division Goal of Nats Abandoned,” Washington Post, July 24, 1929: 13. 6 Povich, “This Morning,” March 7, 1932: 11. 8 Associated Press, “Hopes Rise In White Sox Camp As Jack Hayes’ Knee Improves,” Asbury Park (New Jersey) Press, April 2, 1940: 11. 9 United Press, “Hayes Receives Eye Treatment,” Philadelphia Inquirer, April 9, 1941: 25.